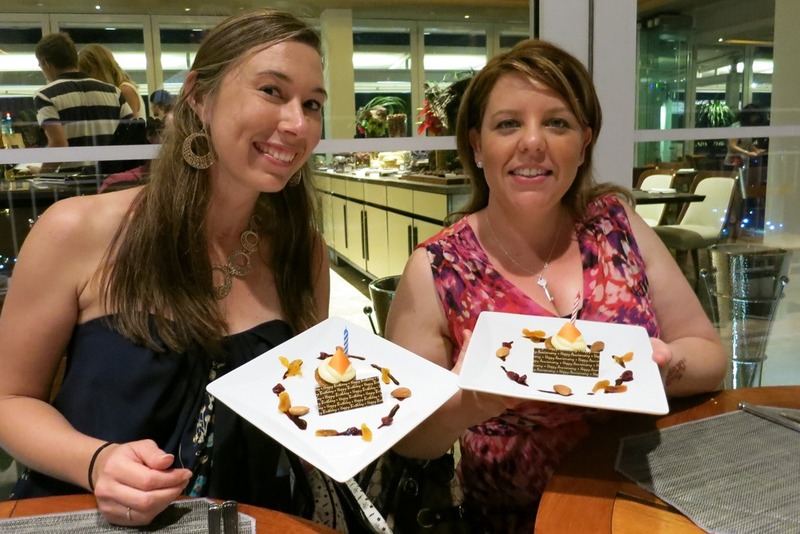 We make the jump today to Singapore – the main point of this holiday was to go back to the Singapore Formula 1 Grand Prix, but we are never ones to just take a short break so tacked on the days in Kuala Lumpur as well as some time in Bali after Singapore. Breakfast again this morning – Cedar on 15 – I know creatures of habit but hey! Headed down to reception to check-out. This was the first time we had been back at ground floor of the hotel since we checked in. The walkway really makes your life so much easier at the Impiana. Check-out was taking a little longer than I expected – the poor girl was having some trouble finding my name on the system. I was a little worried when I heard “are you Mr. Mustafa from Petronas?” – now you don’t know how tempting it was to try and see how far that got! My lovely wife was wondering if I had just decided to buy the whole hotel and we were just arranging the contract. She brings back her manager, who looked at the screen and very quietly whispers in her ear (but loud enough for me to hear…lol) “…um you realise you have the computer in TRAINING MODE!” – classic. Can’t be angry at her, I felt so bad for her. Anyway on our way, this time getting back to the airport was a little trickier, there was now 5 of us which meant 5 Suitcases, 5 Carry-on bags, 2 handbags, 2 camera bags and a laptop bag….. the hotel arranged two cars for us to cram into – not terribly priced at 100RM each. I was a little less than impressed at trusting about $4,000 worth of camera gear on the strength of a Malaysian Taxi driver’s Bungy Cord! But we made it. Check-in was uneventful – except for me having that amazing God given ability to exactly pinpoint which check-in queue would move the slowest (hint: MINE!!!). I mean, seriously – I get that sometimes bookings are not perfect, but why turn up to a check in counter with 15 pieces of luggage when you have only paid for Carry-On and wonder why its an issue!!! !…sorry Rant over. Now a hot tip at KL LCC Terminal, if you are waiting for a flight and want a nice snack, head over toe Hot and Roll they do amazing Parathas, the BBQ Pizza one was incredible – so good we went back for another one each. The server gave my wife that look like “…oh I see you have finished eating that meal and are back for another one….hmm…don’t you think you’ve had enough maddam?” – so I had to purchase any future ones apparently. Anyway – flight was uneventful – and managed to get through the airport in Singapore in pretty record time as well. First time ever our bags were the first two off the plane! I mean when does that ever happen. Caught the shuttle bus to the hotel, it’s pretty good value at $9 per person. If there are a few of you a taxi might work out cheaper but I just always prefer the shuttle. 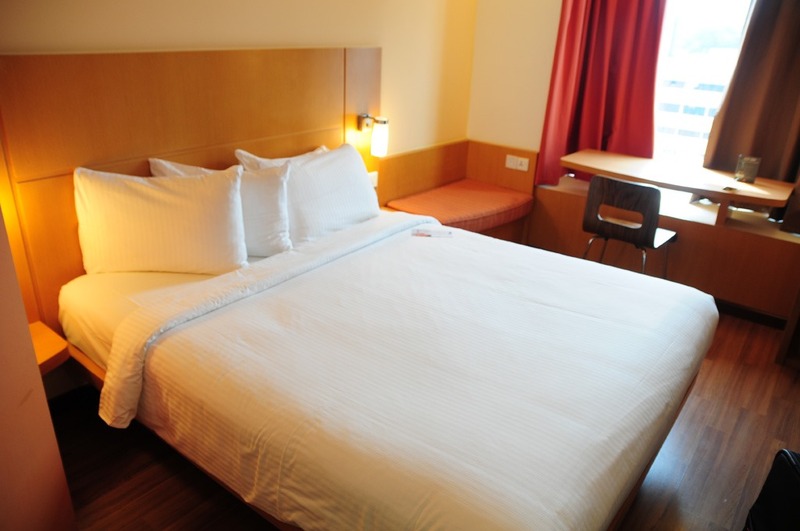 When we head to Singapore for the Formula 1 we always stay at the Hotel Ibis on Bencoolen. It is in the Bugis area and within close walking distance of Little India, Arab Street and at a stretch City Hall. It is also pretty darn cheap, and if you book early and wait for the Accor sale tends to be good value. Especially at F1 time. As you can see – not huge, but a good sized bed, I would call it slightly bigger than a Queen Size. You have a writing desk and there are bedside tables etc. Plenty of room. Gets a bit tight with luggage room, but just be a little efficient. If you are lucky your bags will fit under the bed (our bags didn’t). So there is a smallish wardrobe area, and some shelving. To put it into perspective that top shelf is at about 6 ft 5in high so you do have some storage space. There is a good sized safe in each room as well as probably the smallest bar fridge you will ever see, but good enough to keep a couple of drinks cold. LCD TV with a good selection of channels. 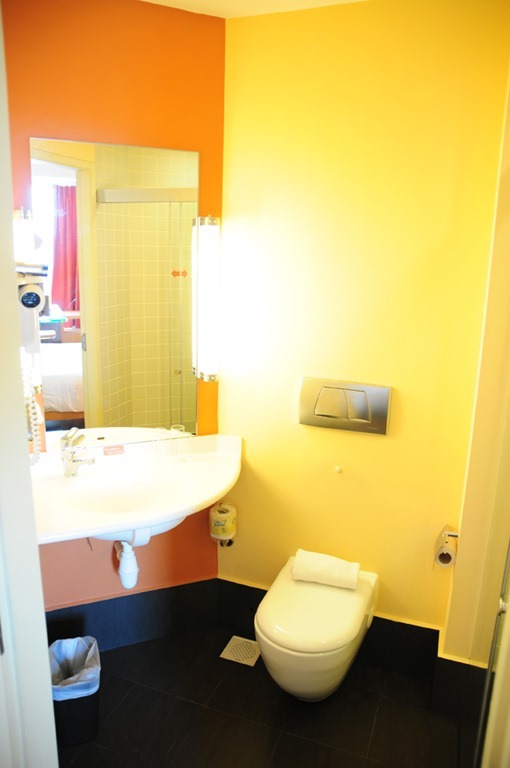 Bathroom – has the essentials….. and I mean how many places in the world you could virtually sit on the toilet whilst brushing your teeth and almost showering at the same time. The shower is actually quite a good size. Breakfasts: Now you do have the option of booking breakfast with your room – it is entirely up to you. 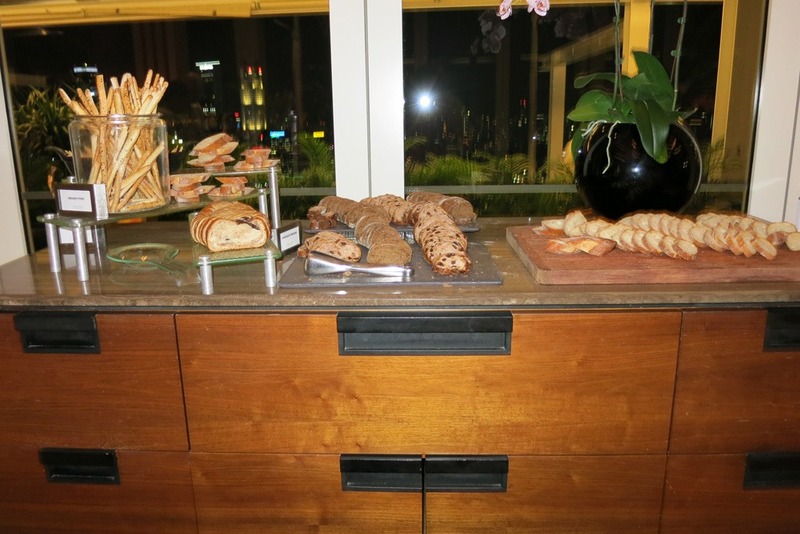 It is a standard hotel buffet breakfast and about $18 per person per day from memory. To be totally honest with you that is a crazy rip-off. We eat at a food court just down the road for $3 per person per day….you make the call. 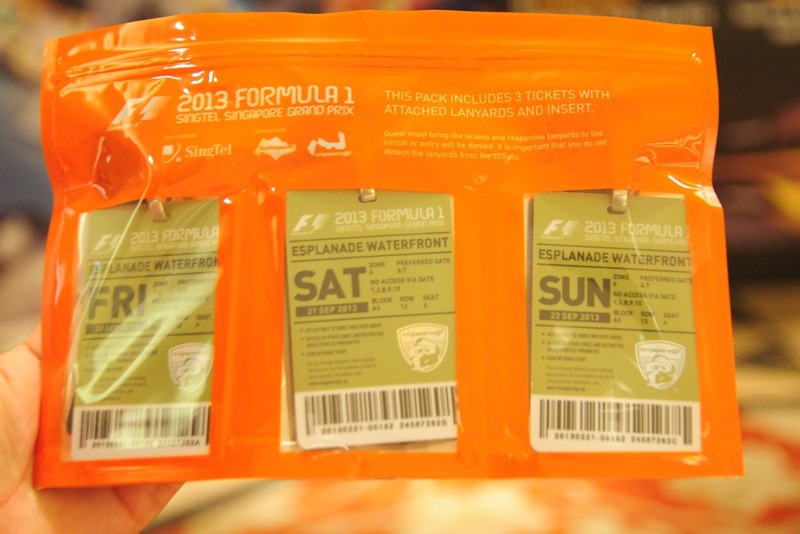 After we settled in we headed off to the Swissotel to collect our F1 tickets – again I am pretty sure my house contract was simpler, you go through 3 staff who verify your documents, then another staff member gets the tickets while another validates the credit card matches what you used to book it! Oh well we have them in our hands and that is all that matters. Anyway – the next destination was the Marina Bay Sands. 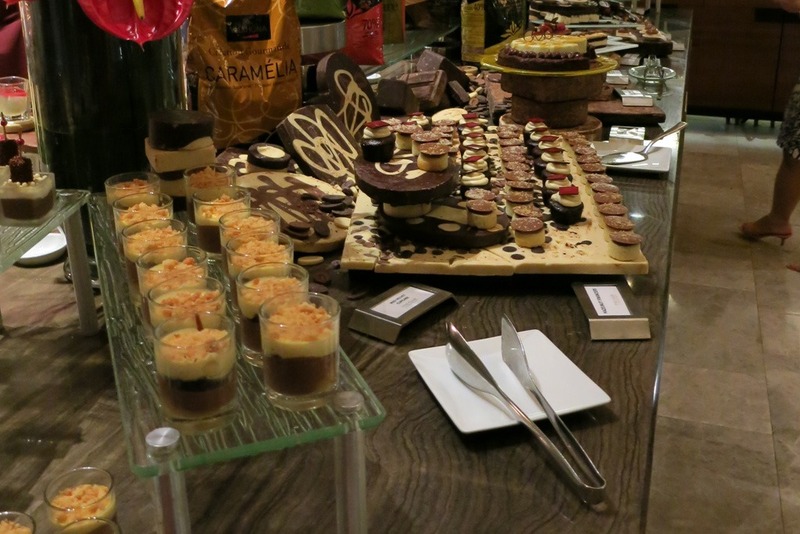 We had booked for us all a really special treat – the Chocolate Buffet up on the top of the Marina Bay Sands Hotel. 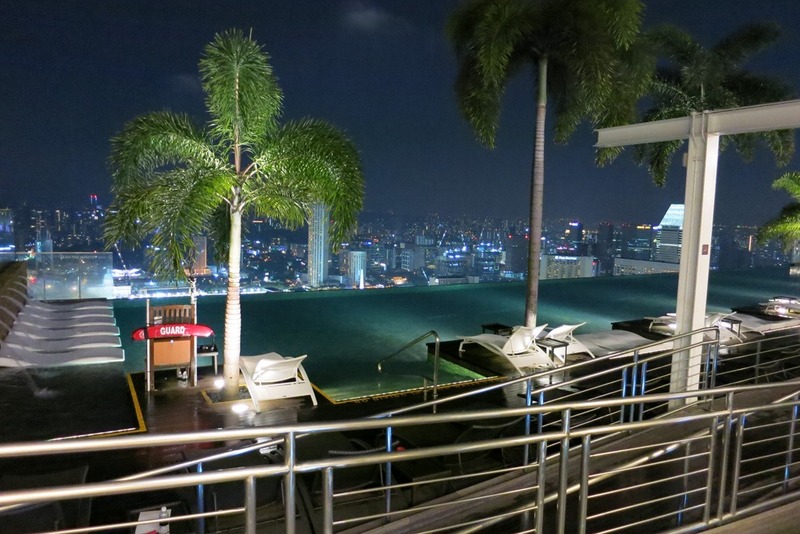 It is located on Level 57 on the Skypark that joins all 3 towers together. 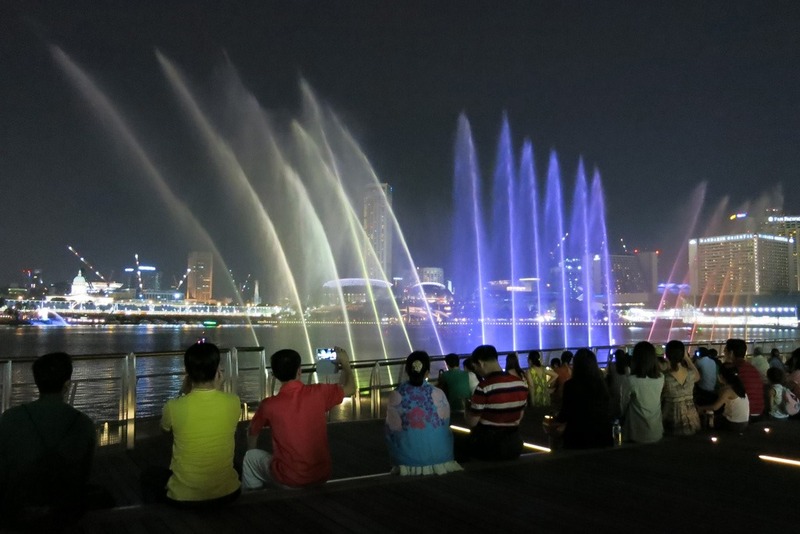 We booked for 8:30pm so had a bit of time to shop at the Shoppes at Marina Bay – wow if ever there was a window shopping only centre it was that one. 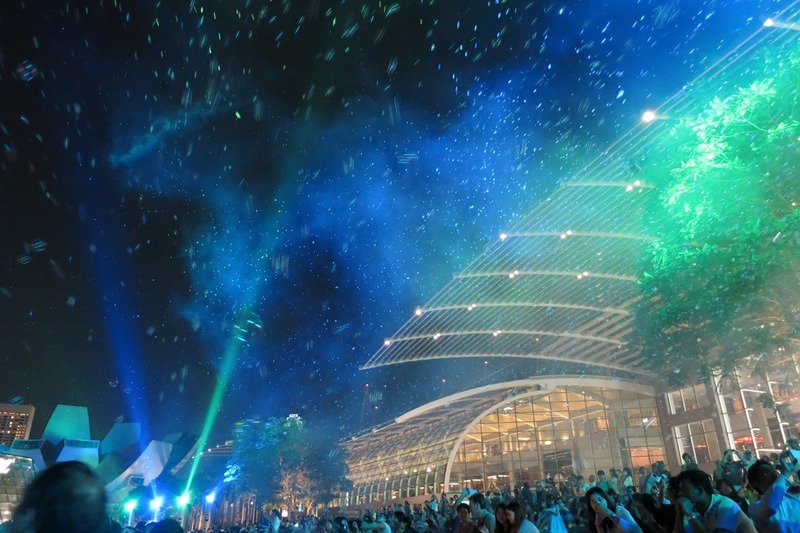 And we also managed to catch the sound and light show which happens each evening in the harbourfront just infront of the shopping centre. It was an absolute glorious evening tonight – no humidity really quite pleasant to be out and about. That skyline is just lovely as the sunsets and also so is that shop on the Left Hand Side of the picture! Thank god that Her Majesty already had her anniversary present by this point! 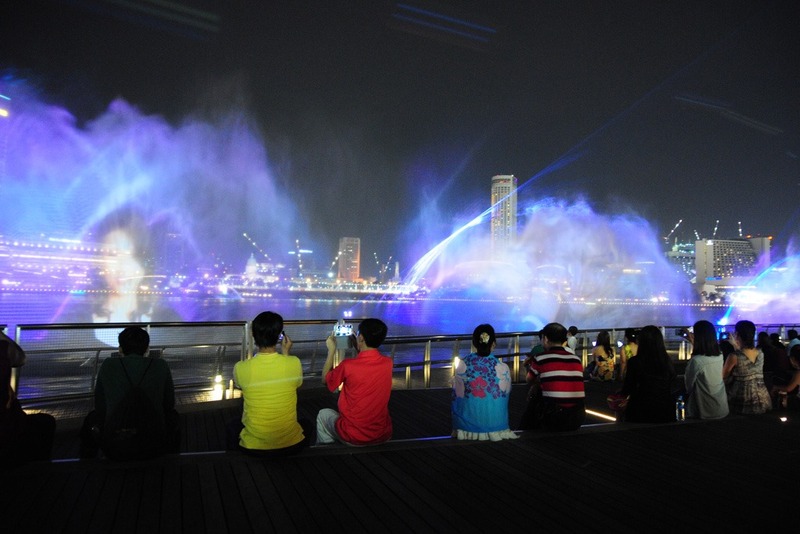 The Wonder Full light and water show, is on every night from 8pm and runs for about 15 minutes through to about 9:30pm. It is a lovely story (I guess – I admit I kind of got lost a little way through) and looks great. The bubbles were a nice touch I felt – it was pretty cool. 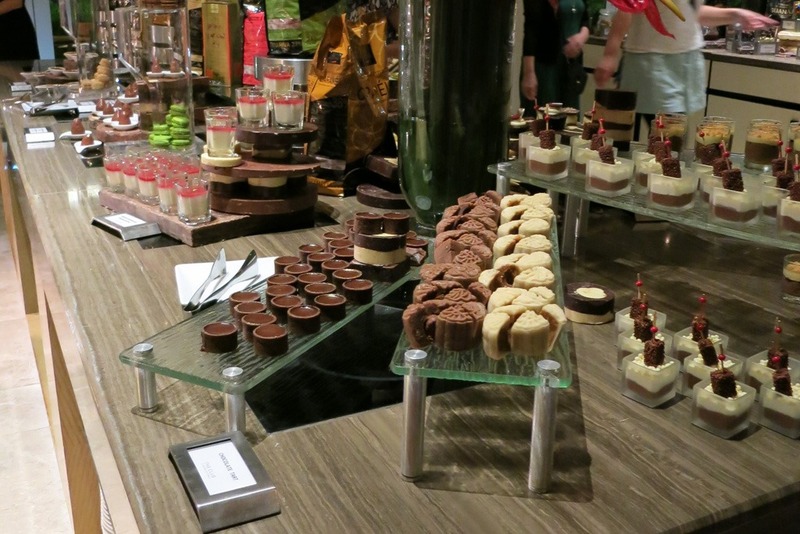 So the lightshow finished it was time to head up to the Chocolate Buffet. Now I will admit it is possibly the least SIGNPOSTED thing in that whole place, so glad we left ourselves time to find it because nobody could give us much help. Everyone we asked said “…its on Tower 2” – which is great and all but Tower 2 doesn’t have public access. So we thought maybe access through the Skypark – NOPE. Eventually we found someone who pointed out we needed to go to the Hostess Desk at Tower 1 (Of course!) and they give you a card for the lift, you then get off and head to another desk on the 57th floor and they will walk you to the restaurant. I mean god how dumb could we be not to find that out. 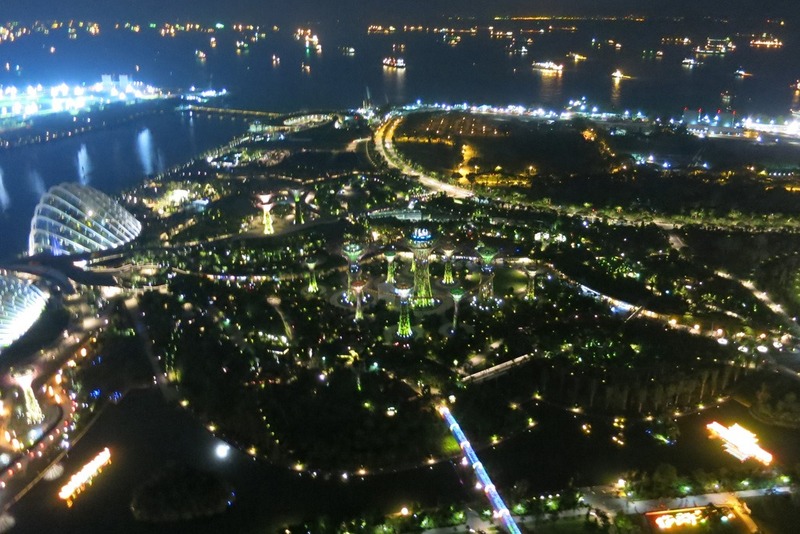 Conveniently now the Marina Bay Sands website has been updated to provide a heck of a lot more information to help you find it. Let me tell you however, that the wait and the stuffing around was worth it. Holy cow! 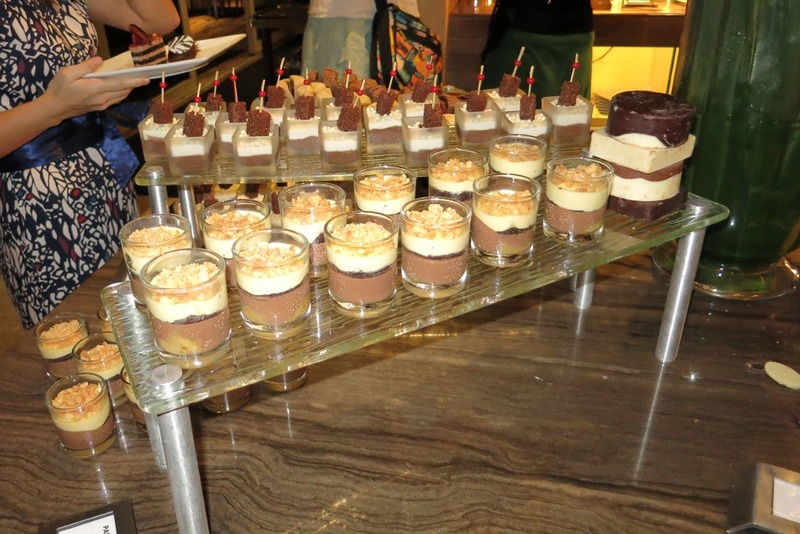 First up the essentials – it is $48 per person for all you can eat at the buffett, for an extra $19 you can get 3 glasses of wine paired to the desserts. Now for some photos because I am not sure I could describe it suitably for you all. The view from our Table – not a bad place to have dinner. That is looking down at the Gardens By the Bay, you can see the big Cloud Dome on the Left. All up there were about 5 different tables of desserts to choose from. All constantly replenished. I think that they say there is something like 48 different options to choose from. 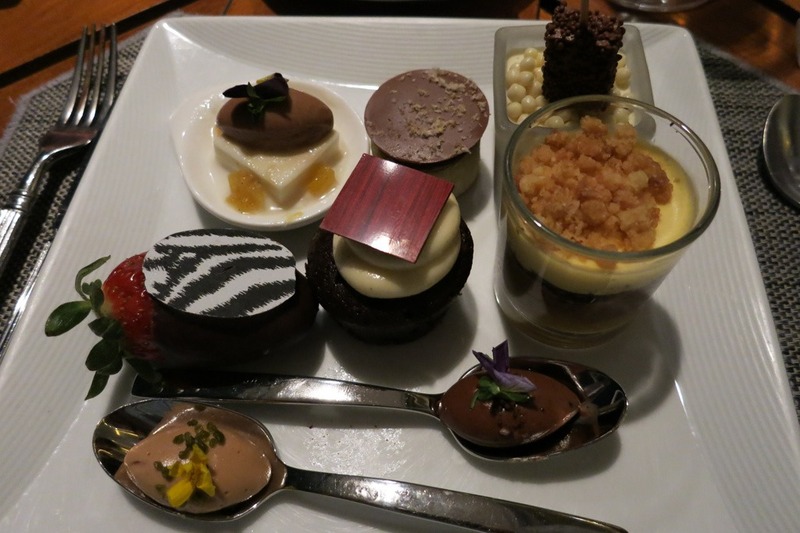 The key here is formulate a strategy, I failed to plan and as a result failed to eat one of everything. Didn’t even get near the CHOCOLATE DONUT STATION! 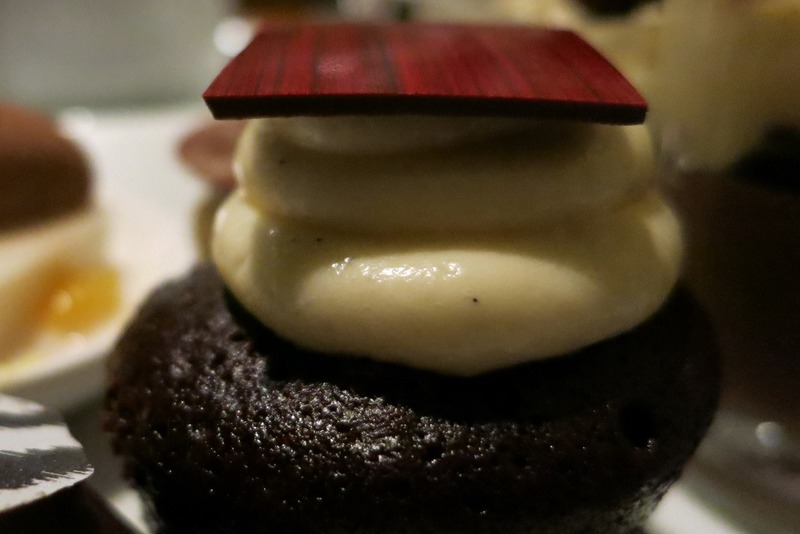 Those Red Velvet Cupcakes were devine. 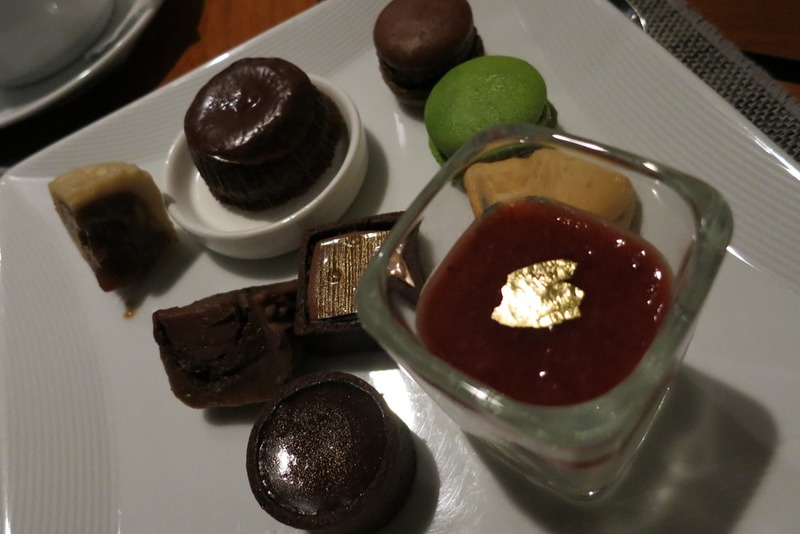 Another assortment, yes that is gold leaf on my dessert….why don’t all desserts come with Gold Leaf? Would make a Soft Serve Cone from Maccas a lot more interesting. I found a new strategy to buy time – get all artsy with photos to allow yourself time to digest before your next sojourn to the buffet table. This evening had a dual purpose, it was partly in celebration of our friend Lesley’s birthday; but also as the celebration for Danielle and my 8th wedding anniversary – I know how lucky is she! 8 years! 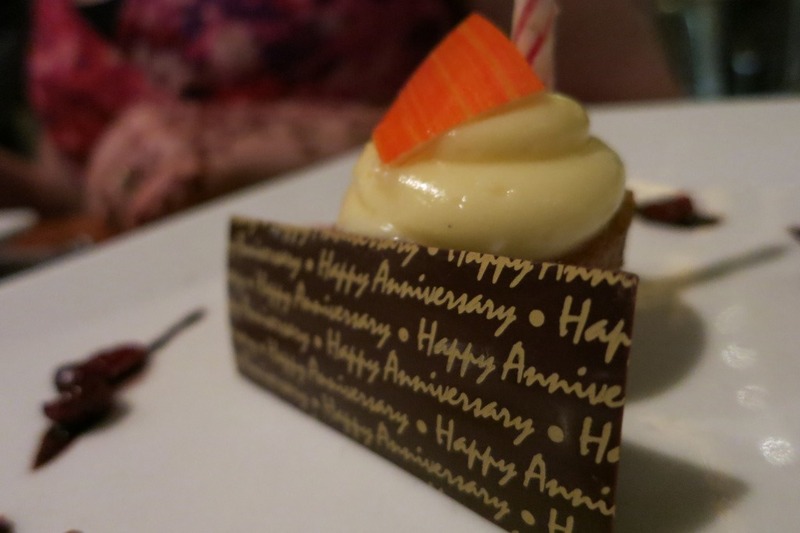 So the staff came and presented us with a little cake for the Birthday girl and for our Anniversary. Was a lovely touch. Lesley with her Birthday Cake, and Dan with our Anniversary Cake. They did light the candles but at 57 floors up outside they didn’t exactly stay lit. I can absolutely recommend you go along and do this if you are in town and want a nice night out. The buffet is open from 8pm till Midnight, you will want to really budget yourself that whole time period if you want to make a serious run at the tables! We walked out of there absolutely stuffed but had a great time. We eventually waddled back to the hotel – absolutely stuffed and rolled into bed. 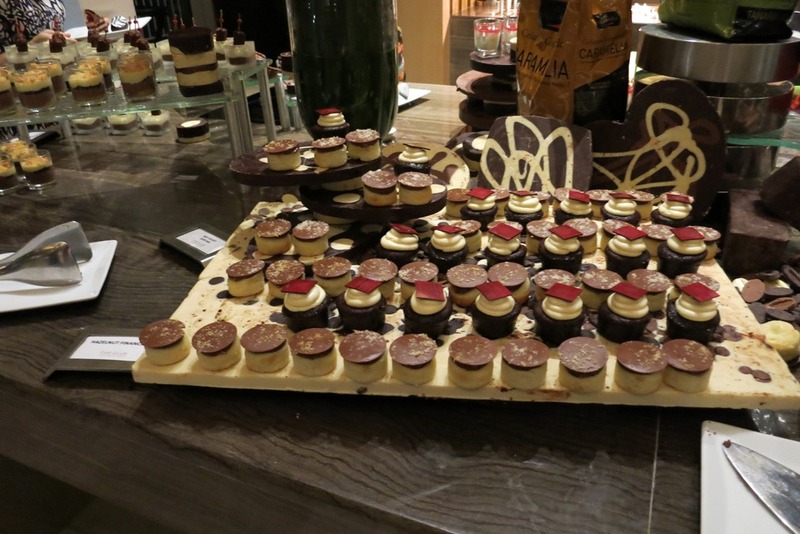 Pretty sure I may have slipped into a Hyperglycaemic Coma at some point of the evening. 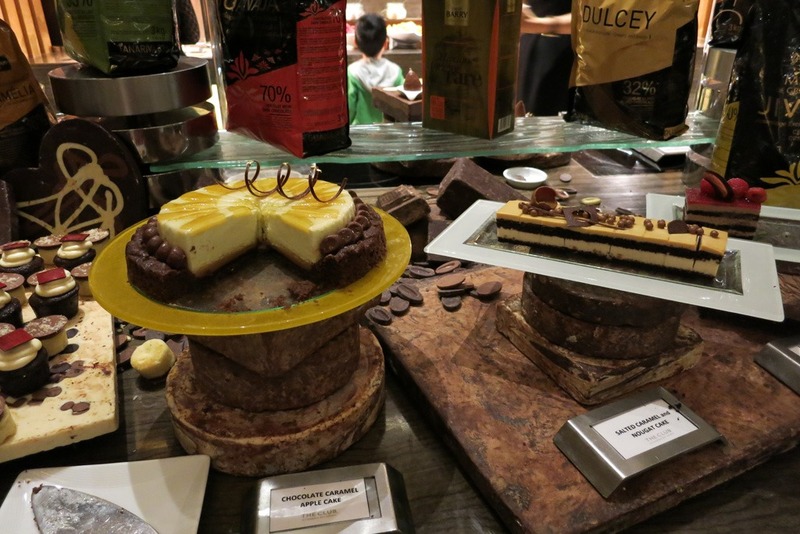 Prior to starting this holiday I had been following a fairly strict Paleo lifestyle – which means no sugar…. ….anyway thanks for reading – sorry it was a little longer than my usual posts – see you tomorrow!